Blake Griffin will step on the court at Staples Center to face his former team for the first time when the Los Angeles Clippers host the Detroit Pistons on Saturday afternoon. Griffin was drafted No. 1 overall by the Clippers in 2009 and spent his first eight seasons in Los Angeles before he was traded to Detroit midway through last season. He helped the Clippers reach the playoffs in six straight years from 2012-17, but they never advanced past the second round. "It'll definitely be emotional," Griffin told reporters earlier this week. "I'm not sure what to expect. I've never been in a situation like that." Six months after he re-signed with the team on a five-year, $173 million contract, the Clippers surprised many when they traded Griffin to the Pistons in exchange for Avery Bradley, Tobias Harris and Boban Marjanovic, as well as a future protected first-round draft pick and a second-round pick. Griffin made his first return to Los Angeles on Wednesday against the Los Angeles Lakers and had 16 points and six assists in the 113-100 loss. Griffin, 29, was held out for rest on Thursday at the Sacramento Kings as the Pistons fell 112-102 for their ninth loss in the past 11 games. Griffin is averaging a career-high 25.1 points to lead the Pistons. He's second on the team at 8.3 rebounds, but no longer logs double-doubles as routinely as he did in his early years. He went without a rebound against the Lakers for the first time in 567 NBA games. Griffin faced his former team when the Clippers traveled to Detroit 12 days after he was traded, but he said he expects this meeting will be far different because he's had more time to digest the trade. "All of that has worn off for me," he said. "I'm happy to be here. I feel settled. I feel this is the place now." Harris, 26, seems at home as well. He's having his best NBA season, averaging career highs in points, rebounds and shooting percentages. He averages 21.0 points and 8.0 rebounds to lead Los Angeles. He's shooting 50.2 percent from the floor after not finishing better than 48.1 in his first seven NBA seasons. His improvement from 3-point range has been even more noticeable. Harris came into this season shooting 35.9 percent from beyond the arc for his career, but is up to 42.7 this season. The Clippers are coming off a 121-100 loss at the Denver Nuggets on Thursday but have won three of four overall and sit in a playoff spot at the halfway point of the season. "I think we're in a good spot," Harris said. "We've been able to find a good flow of how we want to play, a good identity for ourselves. When it's been good, it's been really good. I think at the halfway point there's a lot of growth that we can still make as a team, but a lot of positives going into this point that we've been able to achieve as a unit." 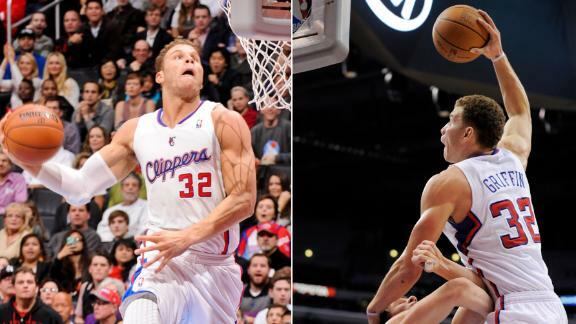 As he prepares to face the Clippers in L.A., take a look at the top 10 plays of Blake Griffin's career with Los Angeles.